Classes run from 9:30am to 1:00pm. Learn to make authentic, restaurant quality Khmer food. A unique and unforgettable experience for those who want to do more than just see the sights. Our Cooking Class shows visitors to Cambodia how to prepare traditional and delicious Khmer dishes under the guidance of a professional Chef. Be guided around the local market about Cambodian vegetables, herbs, spices and other ingredients , see the action and learn about the produce. Our clean, professional standard class is centrally located (approx. 150m from the Old Market) in a traditional style Cambodian house with beautiful gardens for dining in once your meal is made. Contact us at sales@holidayinvietnam.com or sales@vietholidaytravel.com to book this tour or get more information on other Cambodia tours. Learn to make authentic, restaurant quality Khmer food. A unique and unforgettable experience for those who want to do more than just see the sights. 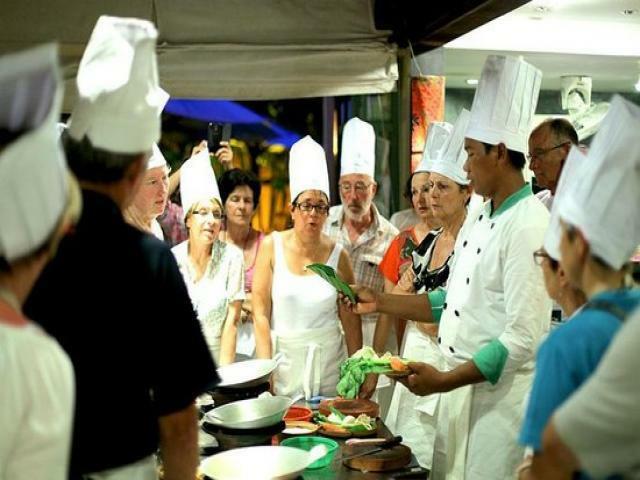 Champey Cooking Class shows visitors to Cambodia how to prepare traditional and delicious Khmer dishes under the guidance of a professional Chef. Be guided around the local market, see the action and learn about the produce. Our clean, professional standard class is centrally located (approx. 150m from the Old Market) in a traditional style Cambodian house with beautiful gardens for dining in once your meal is made.